Every year starting December 1st, I prepare daily Advent boxes for the kids. I bought a little box from the dollar store for each of them and glued a small piece of chalkboard paper to the top to countdown the days. I fill their boxes each day with a little treat, usually a piece of candy like a lollypop or a chocolate. My youngest reminds me everyday about the Advent boxes, and today as I was writing "4" on the top of each box, I was amazed at how close Christmas is and how quickly this time goes by. Lately, I've been enamored with little edible liqueur or candy cups. I even found some peppermint candy cane cups this year. When I was making gingerbread cookies earlier this week, I thought I'd try turning some of the dough into cups for holding eggnog or Baileys. So instead of dipping your cookie in milk, you can pour some milk into your cookie! 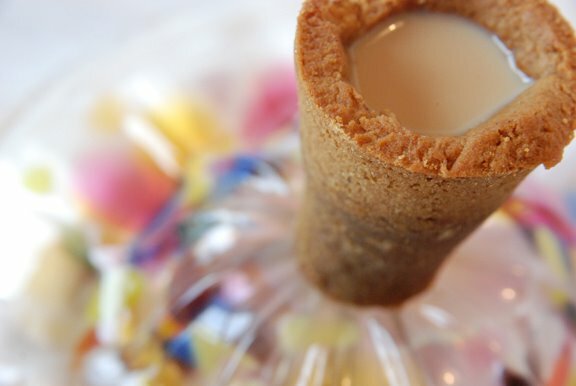 Tip: You must make the bottom of the shot glass cookie thick so that the beverage doesn't seep out. Of course, the cookie will disintegrate the longer the drink sits in the cookie so it's best to serve the cookie from frozen and drink it soon after pouring. 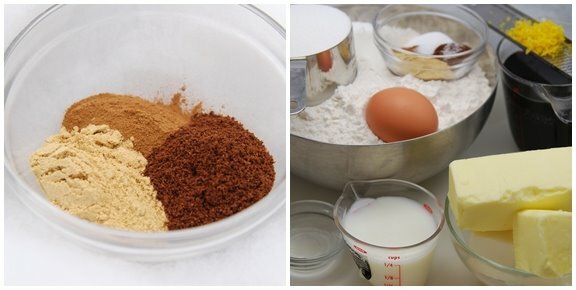 Whisk 5¼ cups flour, cinnamon, ginger, cloves, and salt in a bowl. Using a stand mixer, blend the butter and shortening. Add sugar, molasses, and lemon peel and beat until smooth. Beat in egg and buttermilk. Blend 2 teaspoons water with soda. Beat into butter mixture. In two additions, beat in flour mixture. Add more flour, ¼ cup at a time, until the dough feels slightly firm. Roll out one disk of dough at a time, between sheets of waxed. Preheat oven to 350°F. Bake cookies for 10-12 minutes, turning the pan halfway through the baking time. 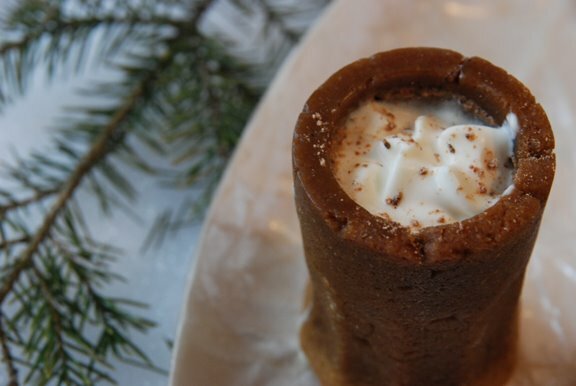 If you made shot glasses, once the cookies have cooled, put them in the freezer. After they have frozen, remove them from the shot glasses. You may have to trim the bottom so that it sits level. Store them in the freezer until ready to fill with your beverage of choice. Brilliant, I love the concept, they look amazing! Really Shari, you are *amazing*...do you dream this stuff up all day long?? Amazing. What a brilliant idea! And fun cookies for grown-ups too! What a neat idea. And I love your Advent box idea as well. I'll have to keep that in mind for next year. This sounds delicious! What if you coat the inside of the cups with melted chocolate? That should be enough of a moisture barrier. WOW - what a creative and fun idea! seriously, you are genius!! :) those are adorable. You have taken holiday decadence to a whole other level. I applaud you! They are so cute ! I have some leftover gingerbread houses material I could use !!! On taking decadence to a whole new level. . . and then I ate my cup! Brilliant! You are amazing! I love the cookies shot glasses. No worries about mine soaking through - Baileys is my favourite! This is such a cool recipe! Would be perfect for a holiday party (heck any party) - I bet it would knock people's socks off. And thank you for linking to my pumpkin spice latte! I may have to take your suggestion make it a reality. Thank you for my elfster gift! I received my package in the mail yesterday and it made my day. I am very excited to read this book...it was on my list of books to check out in 2009! I am excited to check out your blog and see you every tuesday on TWD! Oh how I love these! Happy Holidays to you! You are always full of wonderful ideas! And guess what .. my long awaited christmas gift is here! But I have yet to open it though .. cos its past midnight now ... so I will wait till tomorrow! Thanks Shari! Those are SO cool! Wow! These are so great! Perfect for a fun party treat! What a wonderful idea! It's fun for both the kids and the adults, I love it! What a cool idea both the cookie cup and the advent boxes! I LOVE this idea! Absolutely inspired.